In 1915, the United States experienced the 9/11 of its time. A German torpedo sank the Lusitania killing 1,198 innocent passengers and crew. The ensuing hysteria set the scene as the United States entered into World War I—the bitter, brutal conflict that became known as the Great War and the War to End All Wars. But as U.S. troops fought to make the world safe for democracy abroad, our own government eroded freedoms at home, especially for German-Americans. Free speech was no longer an operating principle of American democracy. Award-winning author Ann Bausum asks, just where do Americans draw the line of justice in times of war? Including thought-provoking parallels between President Wilson's government and other wartime administrations, from FDR to George W. Bush, Bausum's analysis has plenty of history lessons for the world today. Her exhaustive research turns up astonishing first-person stories and rare images. Never before has there been a truer example of the famous maxim, Those who cannot learn from history are doomed to repeat it. I love how political cartoons pack a complete story and message into simple flat panels. Even as a teenager I enjoyed puzzling out the meanings represented by inked impersonators awash in a sea of symbols punctuated by a few choice words. Soon after I began conducting research for the illustrations in Unraveling Freedom, I realized that political cartoons should be an essential part of the book. Cartoonists had chronicled so many important topics during the World War I era. 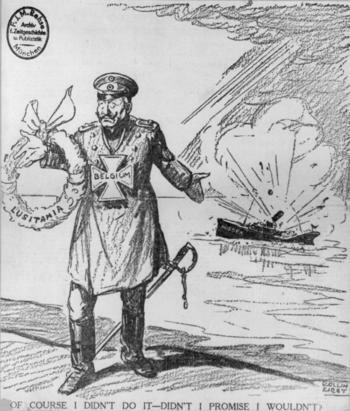 They portrayed the sinking of the Lusitania, questioned the war-time loyalties of German Americans, and debated how best to establish peace at the end of the conflict. Political cartoonists of the day even introduced Americans to Uncle Sam. Artists used Uncle Sam and other symbols—from spiked helmets to dachshund dogs to punctuation marks—to signal their political opinions and to spark debate. The richness of the cartoon record from World War I helped inspire the commissioning of a graphic foreword for Unraveling Freedom by contemporary political cartoonist Ted Rall. His sequential panels deliver a succinct and powerful accounting of how the pressures of war can prompt even the noblest nations, leaders, and individuals to compromise core principles in the name of national security. At the end of this section, you'll find a hidden-object search: "Where's Rehse?" Here are some suggested points of discussion that could be used in conjunction with the reading of Unraveling Freedom. In the classroom—echoes of history. One can discover the echoes of history countless places in Unraveling Freedom. Readers will find them even in the cartoon foreword and the illustrated endpapers of the book (those red pages that attach the pages of the book to the cover). What are some of the echoes you found reading the book? How does the treatment of German Americans during World War I compare and contrast with attitudes toward Arab Americans during the conflicts of the 21st century? In what ways were the sinking of the Lusitania similar and different from the 9-11 attacks of 2001? In the classroom—presidential secrecy. In Chapter 5 ("Between War and Peace," page 65-66) readers learn how President Woodrow Wilson became gravely ill during the final years of his Presidency. The seriousness of his illness remained unknown by most Americans and was not fully revealed until years later by historians. What factors allowed such a major secret to be concealed during Wilson's Presidency? Who helped to keep this secret, and why? Who refused to cooperate? Consider how history might have changed if the news had leaked out. Was it appropriate or inappropriate for the deceit to occur? In the classroom—in the name of national security. Review the "Guide to Wartime Presidents" (pages 74-78) then consider ways that national security concerns have affected home front civil liberties during war time. What are common threads? What are the exceptions to the patterns? Debate the merits of maintaining versus restricting civil liberties during times of heightened national security concern. Should free speech be limited or protected? Can concerns about immigrant populations be justified? How does fear influence foreign policy during wartime? Our national focus on the events of World War II and the decades that followed have left us under-informed about an equally significant period of 20th-century history: World War I. This presentation outlines key developments on the home front during that era that helped to shape the face of modern America. Traditions and values we take for granted today—from free speech to our commitment to the teaching of foreign languages to the treatment of immigrants from enemy nations—all evolved out of events on the home front during the First World War. Drawing on the history presented in Unraveling Freedom, I outline these concepts and identify common threads that carry forward to modern times from this earliest global conflict. The program is illustrated with archival images and a generous assortment of the rich output of political cartoons from the era. "Wartime Rights, Wartime Fights" serves as an excellent foundation for a discussion of the inevitable tensions that arise on the home front over civil liberties versus homeland security when our nation goes to war. Length: approximately 40 minutes for the program, 10-15 minutes for questions. "The speaker was enjoyable and did a good job of engaging the audience. The pictures added a lot to the talk....We thought the comparison of the provocations of World War I to the impact of 9-11 on today's children was effective and very tactfully done." "…Black-and-white archival photos and political cartoons are arranged in an artistic manner with informative captions. Red and blue backgrounds create a dramatic effect in the layout of the text. Appropriate quotations by various people of the time are displayed in elegant fonts. Make this unique and timely offering a definite first purchase." "Writer of the Sibert Honor Book Freedom Riders (2006)….Without belaboring the point, Bausum connects the dots between responses to the 1915 sinking of the Lusitania and the 2001 bombing of the World Trade Center…. [T]he book as a whole is well focused, well reasoned, and clearly written. Handsomely designed….Back matter includes…a useful "Guide to Wartime Presidents," which identifies eight wartime periods in America and, for each, discusses whether (and how) freedom was curtailed and provides a presidential quote. A fascinating, informative book on a topic of perennial concern." "The time couldn't be any better for nonfiction and this book is a new breed of nonfiction. Bausum's newest book is incredible from the first sentence….Bausum's book is a book I would buy for every student in my school, not just because of the depiction of democracy in America and abroad, but rather due to the deft correlations the author draws between WWI and 9/11. The first mention on page 25 and you know the journey you are about to take through the book will leave you a better, more informed person by the end. What a perfect book to use when teaching compare and contrast or democratic ideology….If you only buy one book this year it should be this book. Even the endpapers were considered when putting this book together. Salute to Bausum for a superb work of nonfiction and another to National Geographic for the commitment to publish this work. Grades 5 and up. Highly Recommended." "This fascinating account of the political and social climate in the United States during World War I looks at how intense nationalism and patriotism resulted in growing intolerance and infringement on citizen's civil rights….Author Ann Bausum's insightful look at the often deeply disturbing course of events on the home front during World War I concludes with relevant comparisons to events during other wars in U.S. history, including the current conflicts in Iran and Afghanistan, and leaves plenty of room for astute readers to draw many additional parallels and comparisons." "…I could not put this book down. It was so interesting and well crafted. The similarity of that time [World War I era] to post 9-11 made me feel unsettled. Our society urges us to learn from our mistakes, yet here is a perfect example of how citizens allowed our government to strip us of our rights….The topic covered in this book is important for students to read and understand so that we can try to avoid it happening ever again." 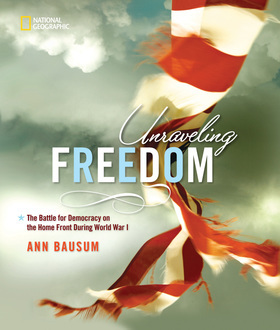 "...For a terrific overview of World War I, look for Ann Bausum's Unraveling Freedom....Written for middle- and high-school students, this book explores irony wrought by the fact that the United States fought overseas in the name of democracy while on its own shores, personal freedoms were restricted, especially for immigrants. Well-written, impeccably researched, and illustrated with dozens of archival photographs and ephemera, this book is a first choice for teachers and parents...."
"From the Home Front and the Front Lines"
See Chapter 2 of my book about the dark side of American immigration for more information about the Red Scare of 1919. This book examines other instances when national security collided with immigrant populations, too, such as the treatment of Japanese Americans during World War II (see Chapter 4). Last Voyage of the Lusitania, National Geographic documentary, 1996. Lusitania: An Epic Tragedy, by Diana Preston, Berkley Books, 2003. See my accounting of the fight for a woman's right to vote. Chapters 4 through 6 detail the conflicts between Woodrow Wilson and suffragists during and after World War I.